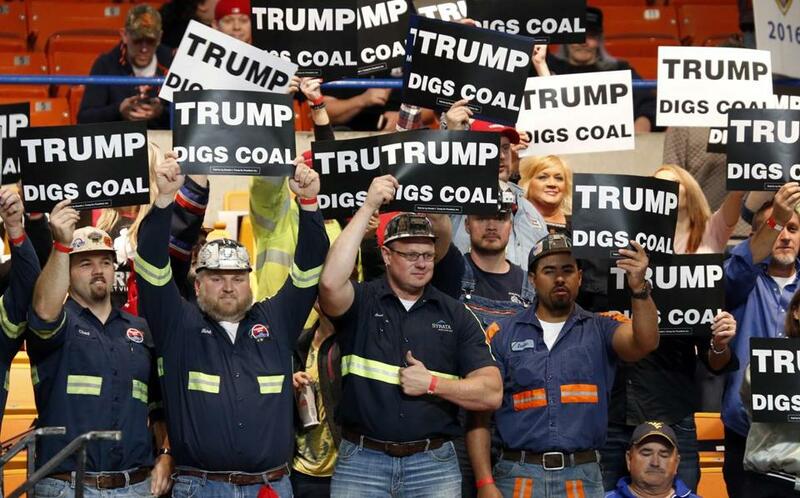 A group of coal miners at a Donald Trump rally in Charleston, W.Va., on Thursday. A state like this one presents a revealing window onto the character of a politician. When John Kennedy came here in June of 1963 to help celebrate the state centennial, it was raining. The people here are as friendly and resilient and warm as anywhere I’ve been. And yet a hard economic rain is falling on West Virginia. Coal, which has long sustained the mountain state, is under siege as a major contributor to global warming. Only recently, coal mining provided fat paychecks here. Middle-aged miners, men in their 40s and 50s, regularly took home eighty, ninety, a hundred grand a year. Guys just a few years out of high school could make $50,000, $60,000 even. The mines sustained families, towns, and a commercial cascade of related industries. Her campaign is repositioning itself to appeal to independent and Republican-leaning white voters. And now, those mines are steadily laying off workers and closing down. Last month, Peabody Energy, the world’s largest coal-mining operation, filed for bankruptcy, one of about 50 coal companies to have done so. With apologies to John Prine, Mr. Peabody’s coal train is in disarray. About 60 miles southwest of Charleston, Logan is a once-booming mining town that’s reluctantly resigning itself to the idea that King Coal has been dethroned. Residents who made a good living in the mines and in mining-related business are trying to find their way forward after the loss of hundreds of jobs. Some friends have gone to Alaska for mining jobs, said Johnny Conn, 43, of nearby Dingess, who operated mining machinery for 25 before being laid off last year. After six months without work, Chase Workman, 25, has found a job more than three hours from Logan, returning home on weekends to see his wife and child. Other long-time miners are struggling to reinvent themselves — and finding it bewildering. “If this is all you’ve known all your life, what do you do?” asked Conn.
That’s a question confronting thousands of West Virginians. There are no easy answers — and nothing that pays anywhere near what coal mining did. That remark was unfortunate both for its active voice, which made the “we” sound like “I,” and for the seeming avidity with which Clinton delivered that verdict. Predictably, however, her remark has been seized upon as though she had issued an enthusiastic declaration of war on coal country. The Clinton campaign knows she handed her opponents a weapon, and in her tour through coal country earlier this week, she tried to repair the damage, saying, somewhat paradoxically, that she had misspoken. The problem, of course, is that if you believe the science on human-caused global warming, as Clinton does, you simply can’t coddle coal. Or promise coal miners you can take them back to that future. Now, if you’ve been earning a good living as a coal miner or in a related enterprise, that’s small comfort. And yet, it’s probably the best a candidate unwilling to morph into a science-denying demagogue can do. Trump, by contrast, arrived in Charleston to a hero’s welcome on Thursday. A crowd upwards of 11,000 packed the civic center, while thousands more listened outside. His message was clear, ringing, resonant, and repeated — and won him roars of approval: He will put the miners back to work. He also attacked Clinton for her close-the-mines comments, saying that they revealed her secret sentiment about coal. “That’s her true feeling,” said Trump. And he’s likely right, to this degree: Her March remark sounded like Clinton’s honest projection of coal’s current trajectory. That’s particularly true if President Obama’s anti-carbon-emissions regulations, which were essential for leveraging the international commitments in the Paris climate-change agreement, hold sway. The US Supreme Court has stayed those regulations while their legality is litigated. But if Obama’s plan goes forward, it would certainly hasten coal’s demise. Global warming isn’t a concern for Trump. He has previously said he doesn’t believe in anthropogenic climate change, and has gone so far as to call it a hoax concocted by the Chinese to hurt the United States. But curiously, having come to the capital of eastern coal country, he avoided any mention of an issue that hangs in middle distance in almost every discussion of coal. His only seemingly allusion came when he donned a miner’s hard hat given to him, along with its endorsement, by the West Virginia Coal Association, and then, after taking it off, noted 1) that his hair had been mussed up; 2) that hair spray wasn’t what it used to be; and 3) that “they” had claimed the old, more reliable hairspray (which contained chlorofluorocarbons-based aerosol propellants) had hurt the ozone. But would that be possible? That is, could the good old days of mining ever return, even with a determinedly pro-coal president, one who didn’t believe in climate change, was willing to walk away from the Paris agreement, abandon Obama’s effort to control carbon emissions from coal, and beyond that, roll back other safety and environmental regulations? That depends on what you think has actually caused coal mining’s decline. Ask whom they blame for the decline of the coal industry, and West Virginians are quick with their answers. The EPA and Barack Obama. They believe the president is adamantly anti-coal — and for no good reason. Asked about coal’s role in global warming, the people I talked to reacted the way I expect most of us would if we found ourselves in a similar position: They essentially wished the connection away. Some called it an unproved theory. A government effort to assert more control over of the economy, several said, echoing Ted Cruz. A George Soros-led effort to erode US sovereignty and promote world government, one conspiracy-inclined older man told me. Then there’s the religious explanation, which I first heard from a man in late middle age who had come to the state Capitol to hear Franklin Graham (son of Billy) speak at a Christian rally: God controlled all that. I heard that again, in Logan, from a retired miner in the local barbershop. And again from GOP state Senator Sue Cline, who represents a district decimated by lost coal jobs. There’s no doubt that this administration has taken a tougher tack on coal than its predecessor, pushing to end mountaintop-removal mining, cracking down on the dumping of mining waste in rivers and streams, and targeting carbon dioxide and other emissions from coal-fired electricity-generating plants. And yet, coal’s real problem has been the game-changing emergence of cheaper, cleaner natural gas born of fracking. Thus utilities are increasingly replacing old coal-burning plants with natural gas-fired facilities. In 2008, about half of US electricity was produced by burning coal while 20 percent came from those using natural gas, according to a recent Associated Press fact-checking article; now, each is about a third, which represents a significant decline for coal and a sizable increase for natural gas. And then there’s western coal’s competitive advantage over its eastern cousin. Part of this state’s problem is that Wyoming, the nation’s biggest coal-mining state, has vast reserves of coal that are cleaner and closer to the surface — and thus easier and cheaper to mine — than West Virginia’s deposits. So it’s hard to see coal, particularly Appalachian coal, making a comeback even under the best of circumstances. If you are a West Virginian whose livelihood has been dependent on coal, that reality is hard to accept. And again, it’s easy to understand, and to sympathize with, their frustration and anger at a disappearing livelihood. But how, as a politician, do you respond? Having made a clumsy comment about coal, Hillary Clinton then returned to Appalachia to try to explain to coal-mining communities her ideas on helping them stabilize their schools, health care, and pensions and aiding them in charting a path to the future. Donald Trump, by contrast, ignored any mention of climate change, dismissed other safety and environmental regulations as ridiculous, and promised, contrary to economic reality, that he would somehow restore their industry to its former status. Clinton got a lukewarm reception, while Trump was hailed as a hero. And yet, who actually took these hard-pressed people and their plight seriously? Who is trying to help them meet the real and unavoidable challenges the future holds? Or, to put it more broadly, who really treated them honestly, and with the respect they deserve?